Steve Glover was educated at Grey High School and then the University of Port Elizabeth, South Africa where he obtained his B.Sc. (1971) majoring in Chemistry and Physics and B.Sc. Hons. (1972) and M.Sc. (1973) degrees in Organic Chemistry. He obtained his Ph.D. from the University of Port Elizabeth in 1976 for his research into reactions and properties of amidyl free radicals. He undertook postdoctoral studies in organotellurium chemistry with the late Professor Sir Derek Barton FRS at The Imperial College of Science and Technology, London for which he was awarded a D.I.C. in 1977, before taking up a lectureship at the University of Port Elizabeth. In 1985, he took up a position at the University of New England where he is currently an Adjunct Professor. His research interests span the areas of physical, biological, and computational organic chemistry and he has over 160 scientific and conference papers. He also has a strong interest in modern approaches to teaching organic chemistry, which he has published in the chemical education literature and has presented at international chemical education symposia. 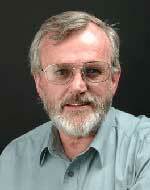 In 1997, he was awarded the University of New England Vice-Chancellor's Award for Excellence in Teaching. He is a Fellow of the Royal Australian Chemical Institute.